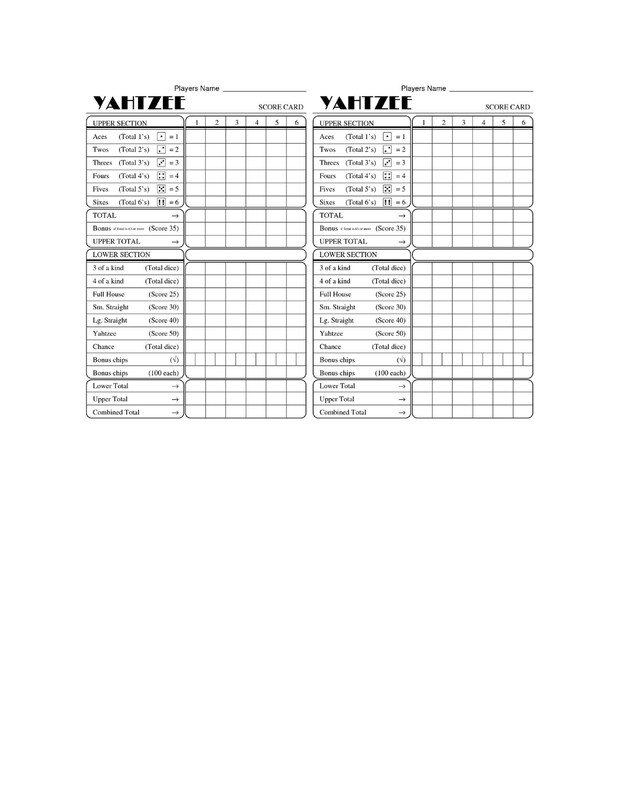 Yahtzee is a game which has been around for years now and was created by Milton Bradley. Now owned by Hasbro, this game was first marketed with the name “Yatzie” by the National Association Service of Toledo in Ohio, way back in the 1940s. 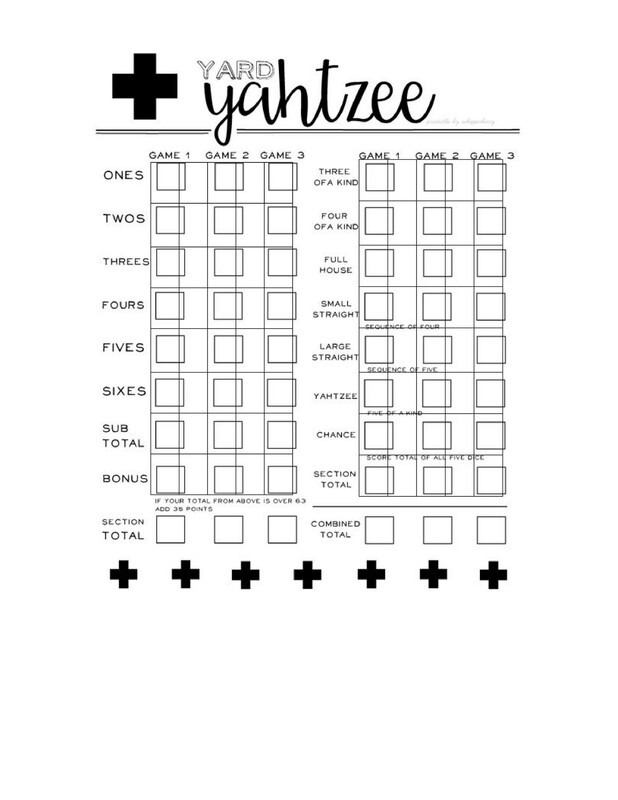 Yatzie started out as an inclusion in a game set called Luck, which came with 15 kinds of dice games. 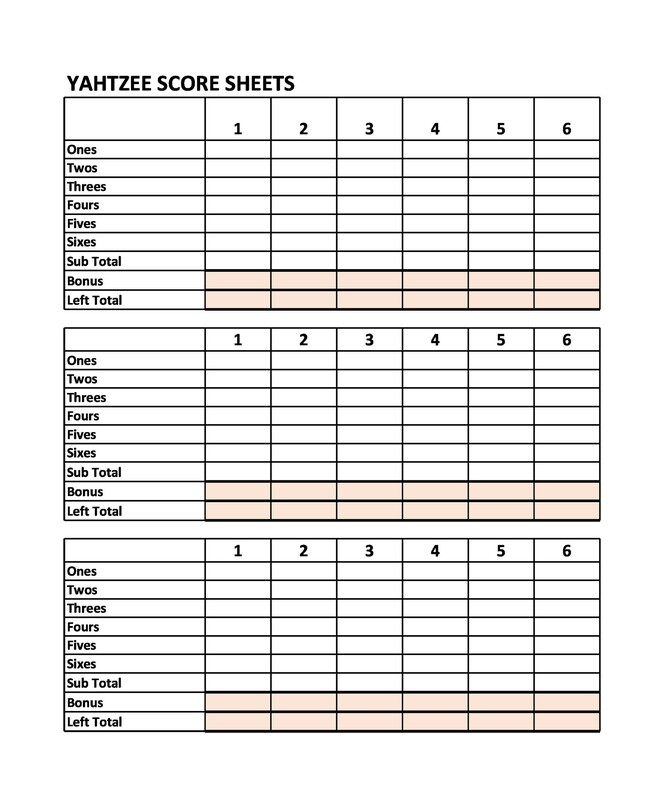 4 What are Yahtzee Score Sheets For? 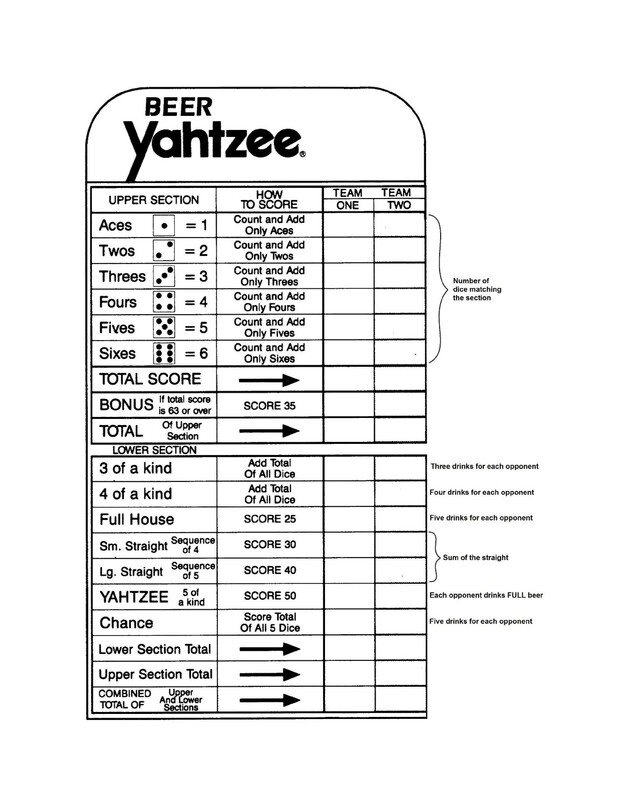 Then it was marketed with the new name – Yahtzee, by Edwin S. Lowe, a game entrepreneur back in 1956. Lowe was also responsible for bringing and introducing Bingo to the American market. This game is a product of the development of earlier dice games. 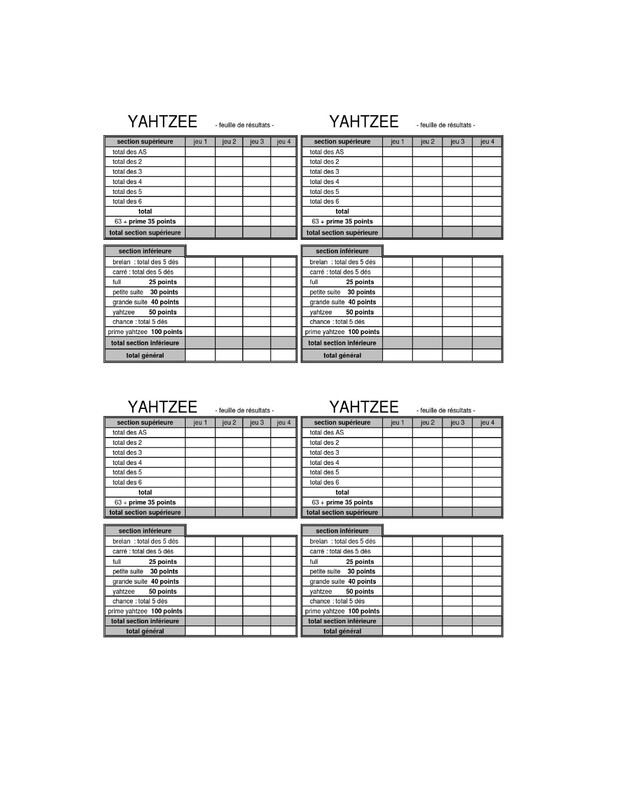 Dice games similar to Yatzy such as Yacht, Poker Dice, and Generala. 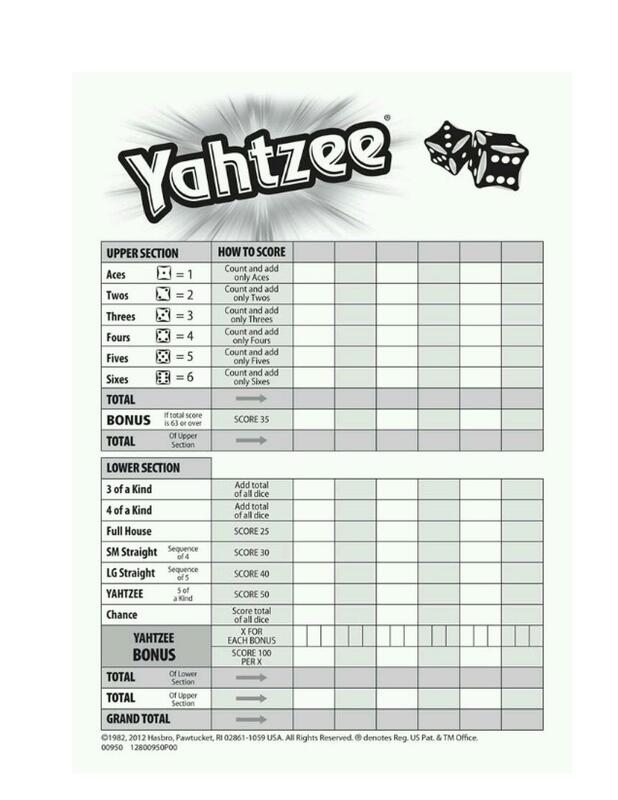 Basically, the objective of the game is to score points, which will be recorded either on a Yahtzee score card or a Yahtzee score board, by rolling 5 dice and making specific combinations. You are allowed to roll the dice up to 3 times every turn in order to try and come up with different combinations to earn points. One whole game is made up of thirteen rounds. At the end of each round, a player would make a choice on which category for scoring will be used for that particular round. There are different categories for scoring and once a particular category has already been used in a round, it can’t be used again. The categories for scoring have different point values. Some values are fixed while others have scores which would rely on the dice value. 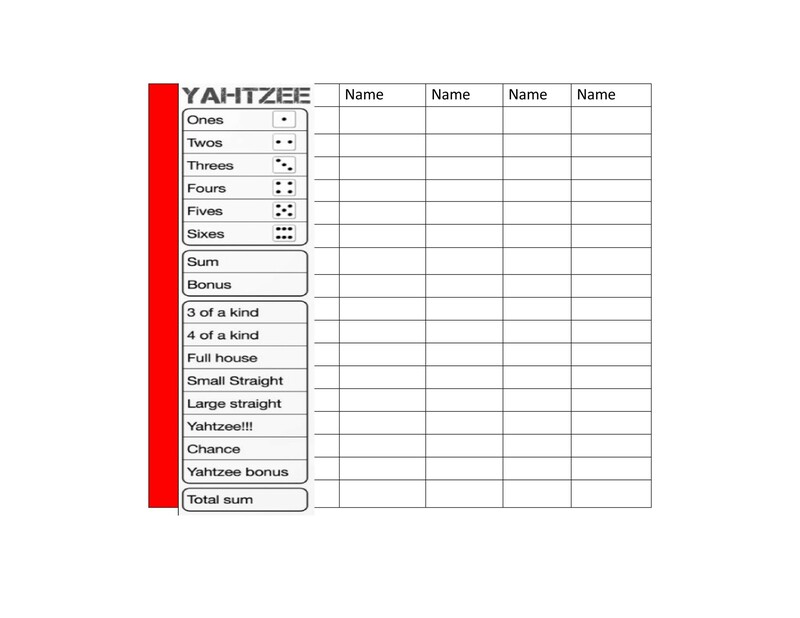 A “Yahtzee” refers to a five-of-a-kind dice roll and the player who rolls it scores 50 points. This is the highest scoring for any category. At the end of all the rounds, the winner of the game is the player who scores the most points. 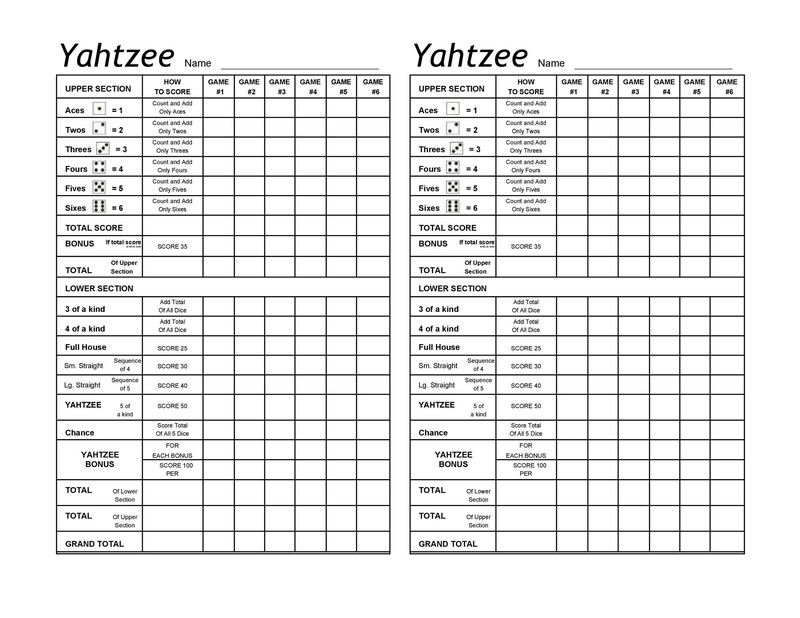 Yahtzee is made up of 13 rounds. In each round, you will be rolling all the dice and recording the score. There are 13 score categories, which will be discussed further on. You have to score once using each category. This means that as you are approaching the end of the game, you may have to settle with a score of zero in some of the categories. The objective of the game is to get a high score. The game would end once all the 13 categories have been scored. There are 5 dice which you can roll and you have to roll them all at the same time. Once rolled, you need to score the results by choosing from one of the scoring categories. You can stick with what you’ve come up with or re-roll the dice. For each turn, you can roll the dice a maximum of three times. So it’s a game of chance since you can choose to stick with what you’ve rolled of re-roll the dice where there is a chance you get a roll worse than what you’ve previously come up with. When you’re happy with your roll, you can score it and another player can take a turn and repeat the process. The game ends when all the 13 categories have been used to score. Now that you are more familiar with the rules of the game, let’s move to how you will be scoring. When you roll and you are happy with the dice combination you come up with, then you can start scoring from the 13 categories. To do this, you will choose a score category and score your dice accordingly. Once a category has been chosen for scoring, you won’t be able to use that category again throughout the entire game. Also, once you’ve set the category for scoring, it cannot be changed anymore. 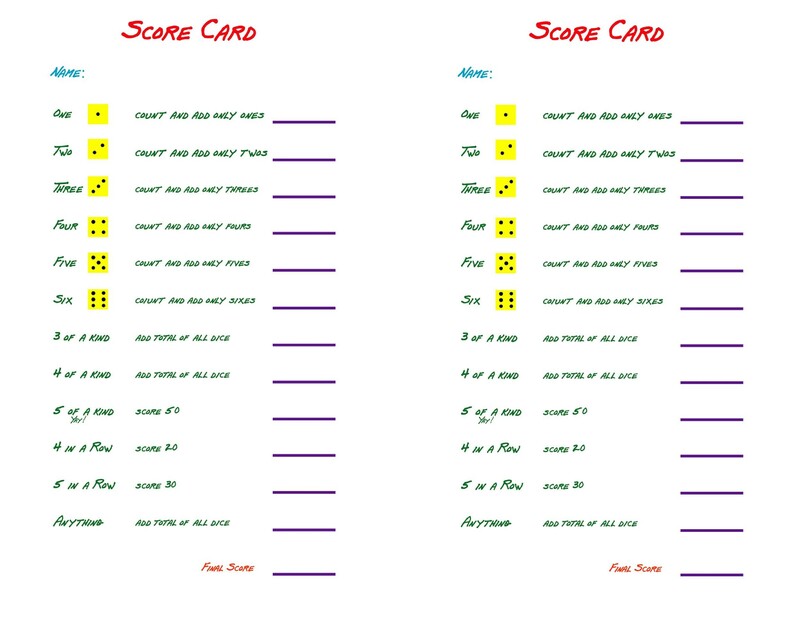 When scoring on the upper scores category, you will only take the total of the specified die face. For instance, if you roll 3,3,6,3,4 and you score in the threes category, you would have a score of 9. However, if you roll this dice combination and you are scoring in a different category (ones, twos, fours, fives or sixes), then your score would be different. When the game is done and your score is 63 or more in this category, then you will get a 35 more points added to your score as a bonus. When scoring on the lower scores category, you will either be scoring a set amount as defined by the category or a zero if you don’t meet the requirements of the said category. For the three of a kind category or four of a kind, you should have at least three of the same die faces. When you have that, the total of all the same die faces as your score. For straights, you will have to roll a straight sequence of consecutive die faces to qualify. When you are able to get this combination, you would have the total of all the dies as your score. For a full house, you must have 3 of the same die faces plus a pair. Rolling this combination would give you a score of 25 points. Simple enough, especially if you have been playing the game for some time now. It may seem quite complicated when you’re new to the game. But as long as you read the rules and you use the score card, you will be able to play the game well enough. 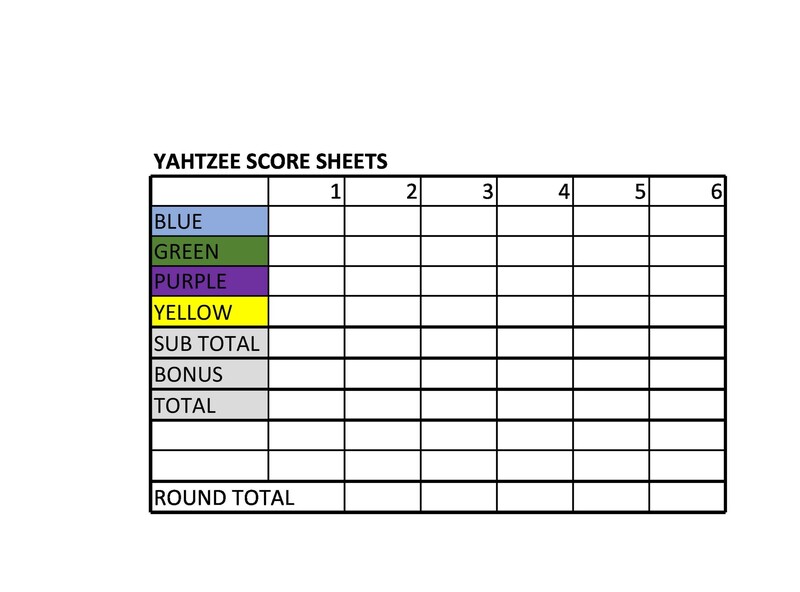 What are Yahtzee Score Sheets For? Basically, the score sheets are there to help guide your game. While you are playing, there are a number of different number or dice combinations needed for you to obtain a score. There are two main scoring categories and without a proper sheet to record your scores, you might end up getting confused. The upper section of the scoring categories is made up of points which are scored by gathering the dice which have the same number and writing down the totals. Players who are able to get a score higher than 63 points are given 35 additional points. The lower sections of the scoring categories are made up of categories which are like hands in poker games. Some of these categories are three of a kind, four of a kind and three of a kind plus a pair, also known as a full house. Coming up with three of a kind or four of a kind would result in a score which is total to the results from having all of the five dice thrown. However, if you are able to throw a full house, you will be able to get 25 points directly. 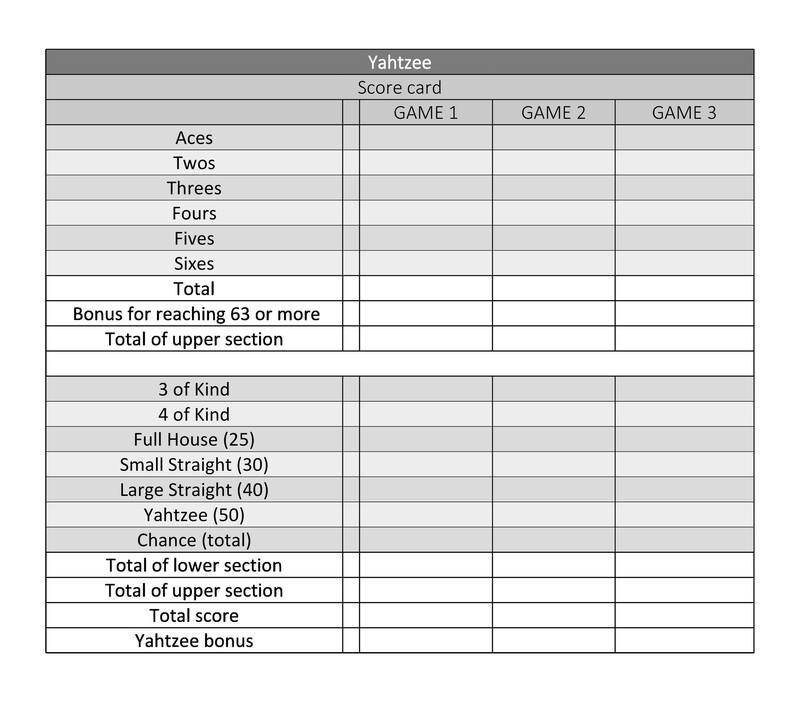 The term “Yahtzee” doesn’t only refer to the name of the game. It also happens to be one of the categories in the lower section of the score sheet. This category is made up of a five-of-a-kind combination which would give the highest possible score to the lucky player. 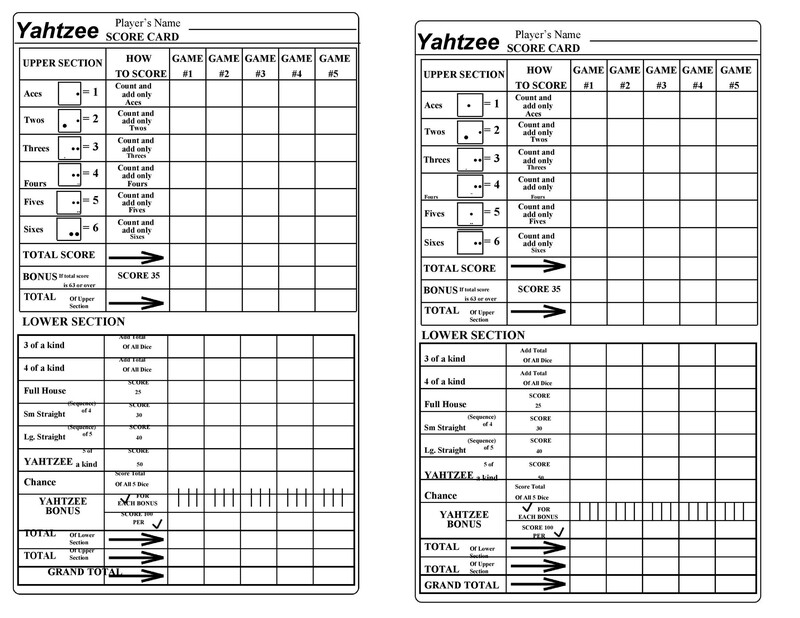 The player then has to declare, “Yahtzee!” when qualified for it. This scoring category also happens to be the only one which can be used more than once in the game. 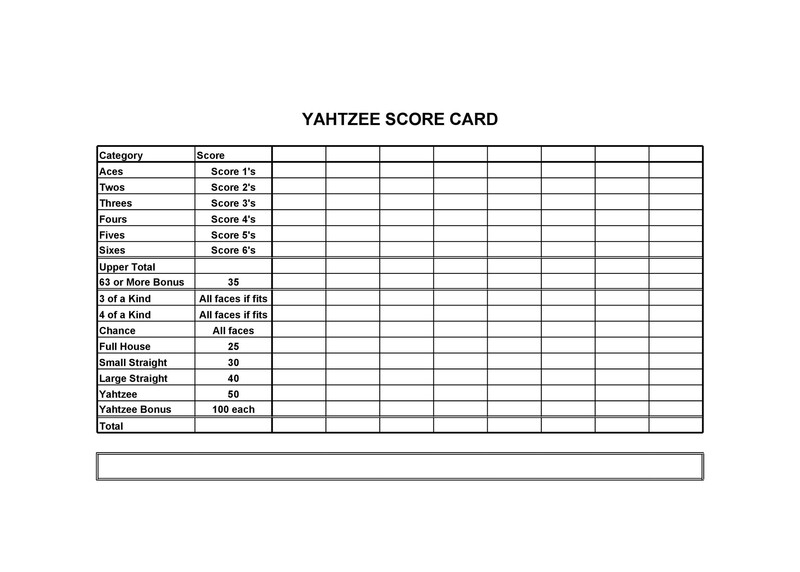 Any subsequent Yahtzees would be equivalent to 100 points each. 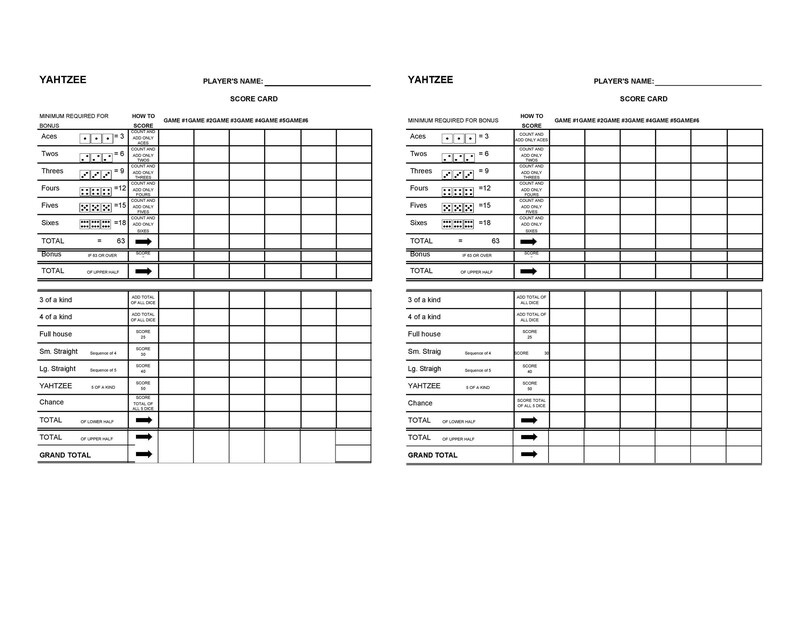 Score sheets which are specially made for the game are also quite economical. This is because you will be able to use just one sheet to play as many as six games. This saves a lot of paper and allows you to continue playing and recording your scores. But what happens when the sheets that come with your game run out? We’ll be talking about that in the next section. This requires more time and effort, but it can be quite rewarding. You won’t have to spend too much and whenever you need them, you can just make them. Making sheets is quite easy and can save you a lot of money. We will be discussing how to make sheets later on. 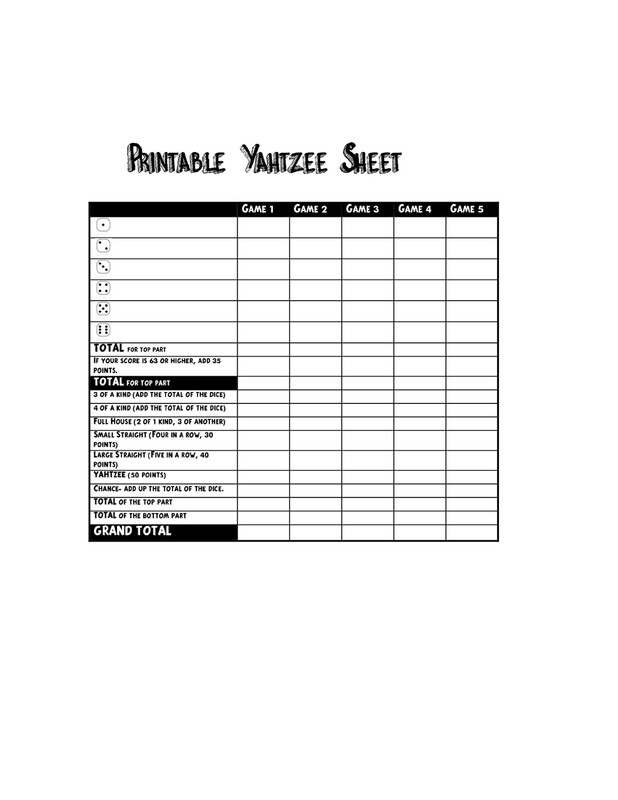 If you have access to the internet, you can just search for printable Yahtzee score sheets online. There are a good number of sites which offer these templates for free. All you have to do is download them and print them out. You can also choose to buy new score cards when you run out. You can get these sheets from the same place you had purchased the actual game. Of course, this wouldn’t require any effort on your part, but you would be spending more than when you choose to make or download the sheets. So as you can see, when you run out of the sheets for scoring, you don’t have to stop playing the game. 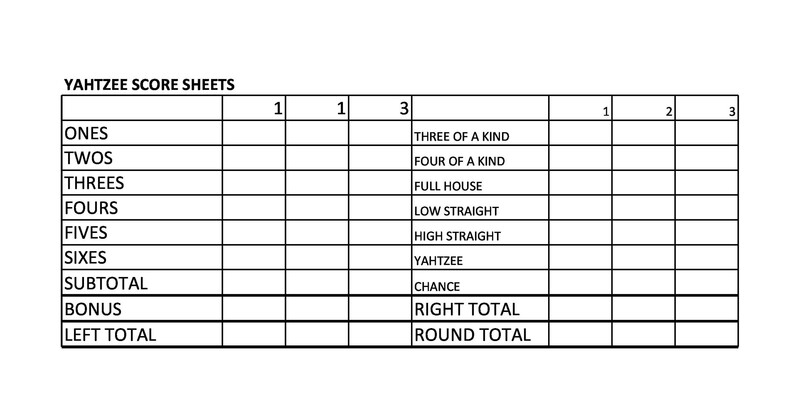 There are different options for you to come up with new sheets to record your scores. 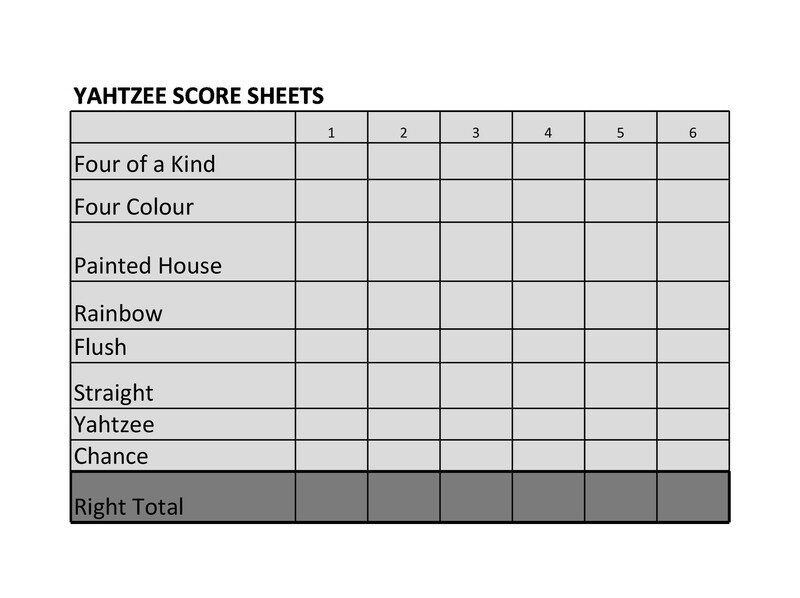 Let’s move on to some tips to guide you if you choose to make your own sheets for scoring. 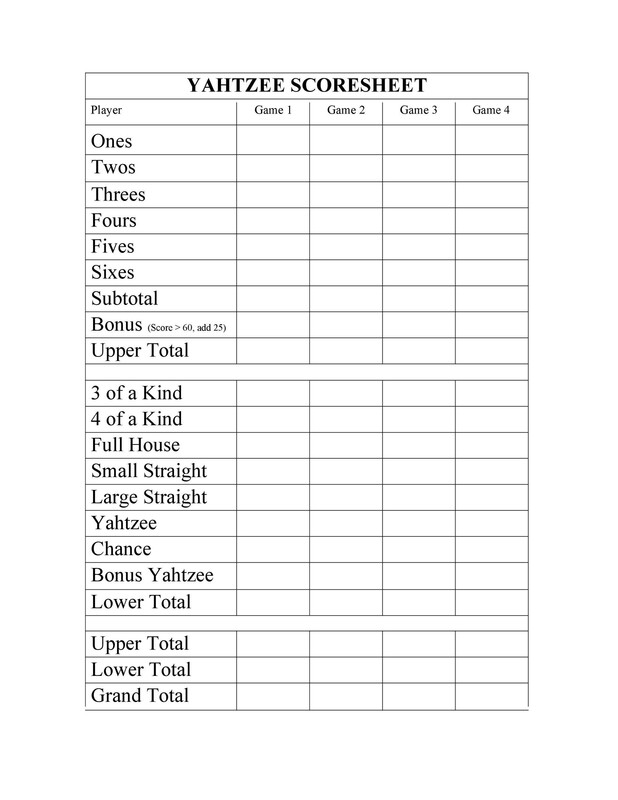 When creating a template, try to design it so that you are able to play multiple games using just one sheet. 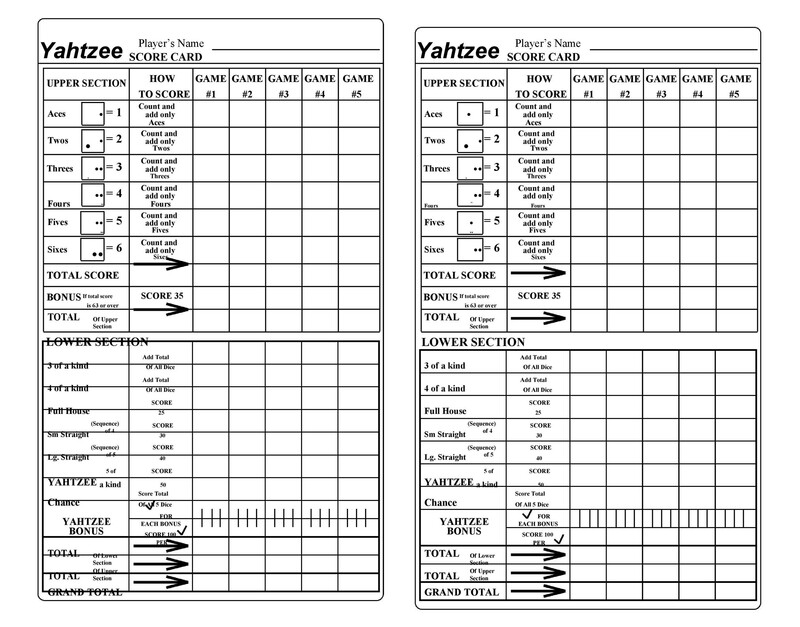 Of course, before you make scoring sheets, you would have to know how to play the game and how to use the Yahtzee score sheets. There are a lot of online resources which offer free templates. You can either print them out directly or use them as a reference for making your own. Some websites also have electronic scoring techniques, which are convenient. However, you’d have to e online while you are playing the game. Place spaces for the names of the different players as you won’t be playing this game by yourself. It’s much more fun to play with other players. Simple tips, but they can yield good results when you keep them in mind as you are making your own sheets or cards for scoring. The steps in doing so are outlined in the next section. 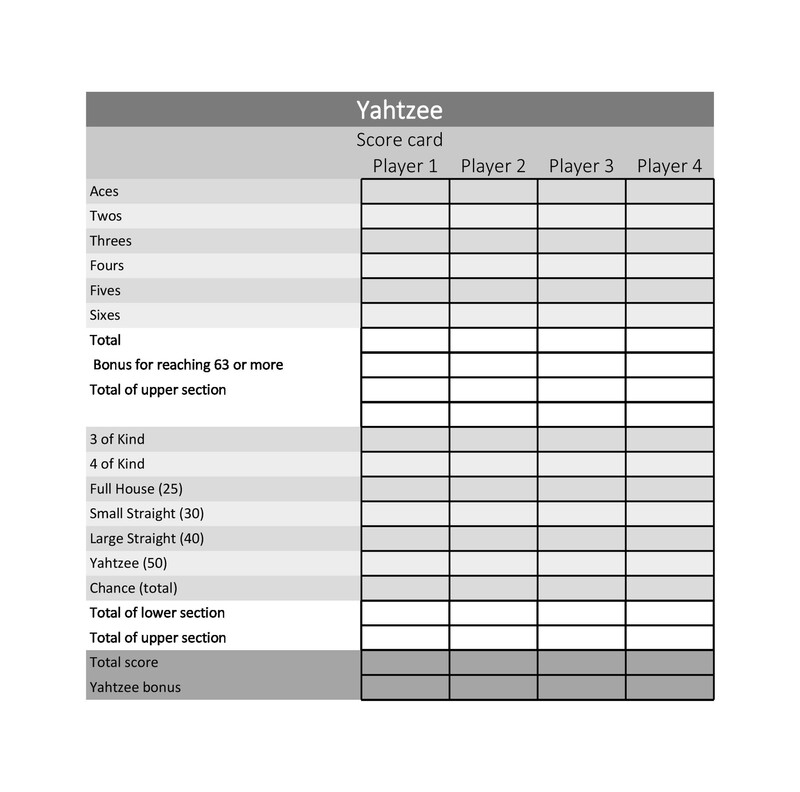 Making your own Yahtzee score card can be very simple, especially if you are guided by useful steps. As you will see, it doesn’t take a genius to replicate the score sheets. So when you use up all the sheets that come with the game, all you have to do is make your own to be able to continue playing. Take a sheet of paper, either lined or unlined then fold it in half. Using a pair of scissors, cut the line in the middle of the paper which was made by your folding it. Then you are left with 2 sheets of long paper. Write down numbers 1-6 on each of the lines of the paper. Next, you should write down all the reminder items for point totals. You have to write reminders for each of the items in their own separate columns. These reminders are important as they serve as guides when you are recording scores throughout the game. Familiarize yourself with these reminders so that you can include them in your own templates. 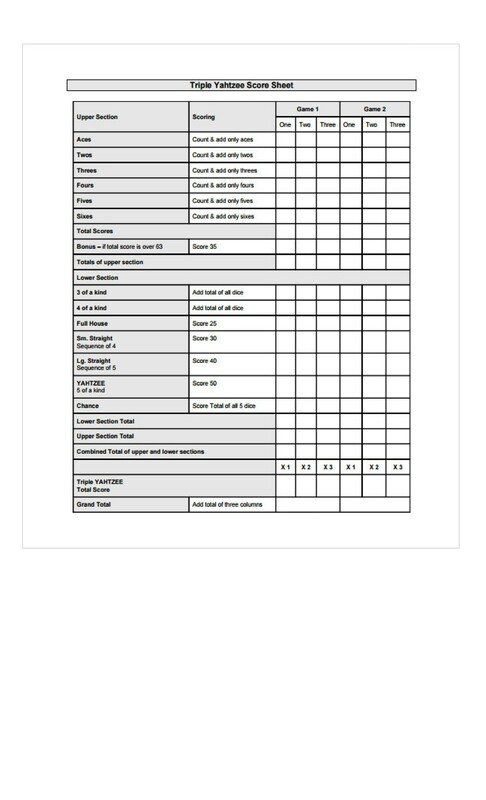 Either use your old score sheets as a reference or download and print sheets from the internet and use those as reference as you are making your own sheets for scoring. Next, you should add another line to the top portion of your sheet to write the grand total. 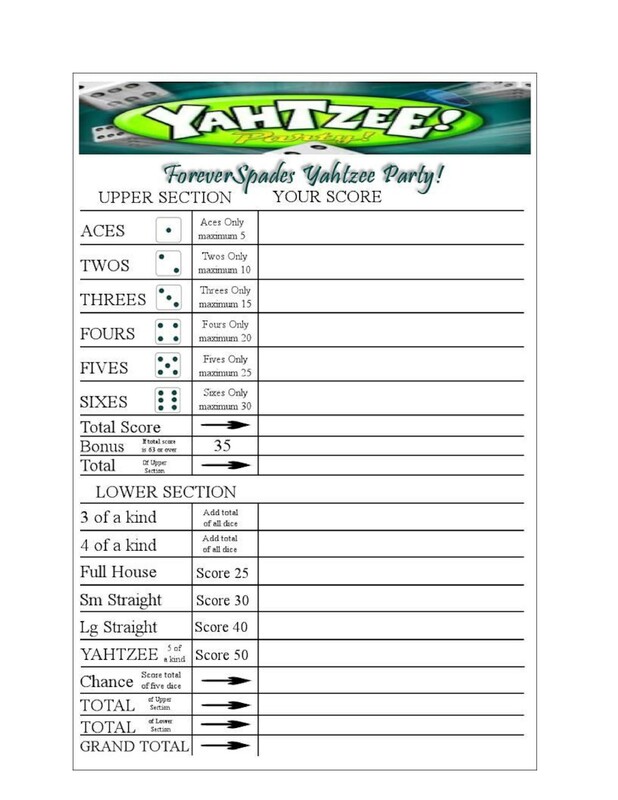 Yahtzee is the best roll possible and would result in a score of 50, so write that reminder down. Chance means that you will be recording the total value of all the dice so you will be leaving the next column blank. As you are playing your game, record all the scores of all the players on your score sheet. Use the sheet the same way you would use the sheets that come with your game. When you are done playing, total all your scores and write the total on the very last line of the sheet. 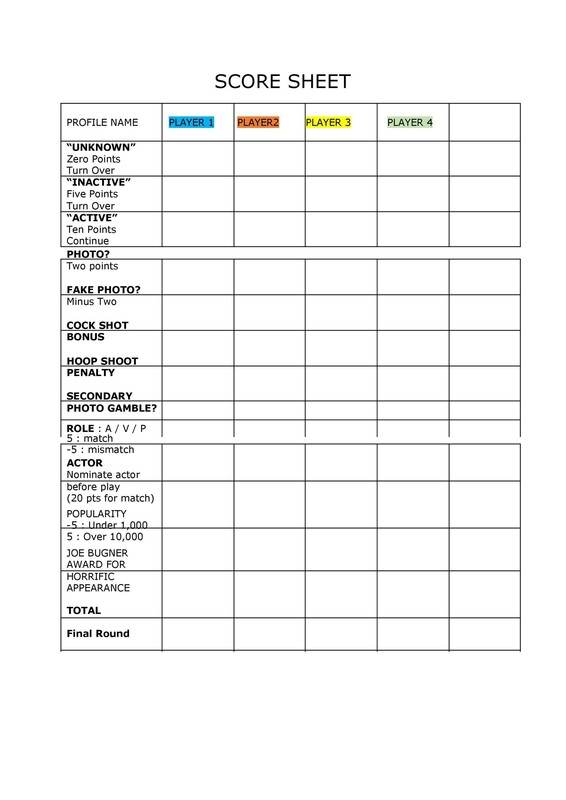 Making your own sheet or card for scoring is easy as long as you’re familiar with the format. As stated previously, there are different ways for you to acquire a reference for your own customized sheet. 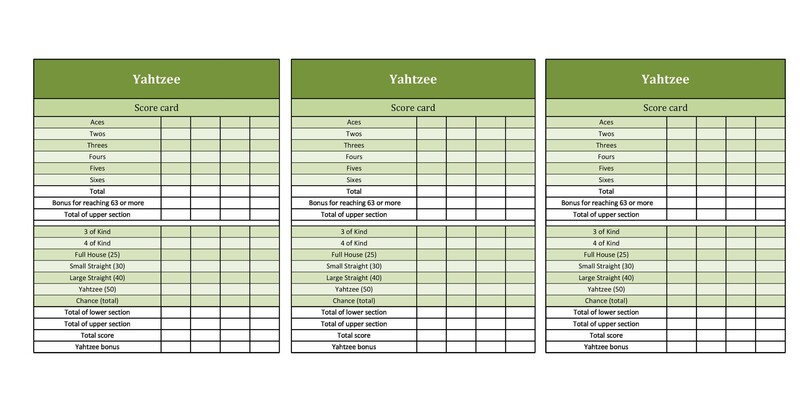 To be able to be even more economical, we’ve come up with steps to guide you in making a reusable score sheet in the final section of this article. 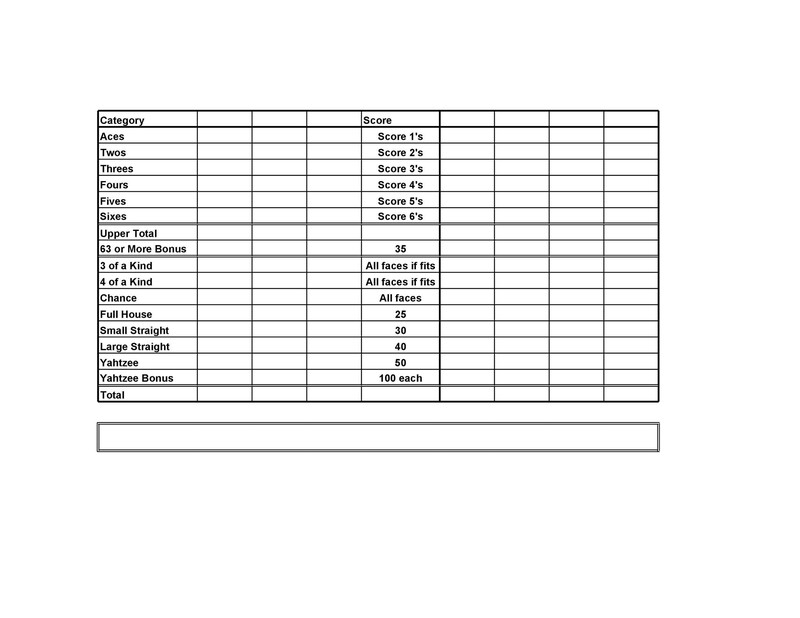 Make a bigger copy of the score sheet which is typically used in the game. You can either download a ready-made template from the internet or make your own template using the steps outlined in the previous section. Once you have your sheet, insert it into the transparent folder. Seal the folder so that your sheet doesn’t slide out. It’s also important to seal the folder so that when you are wiping it clean, the paper inside (the sheet itself) doesn’t get wet. Try writing on your score sheet using washable markers. When you’ve written on the folder, test it by wiping the writing off with a damp cloth or paper towel. If the writing comes off, you’re good to go. However, if you cannot wipe off the writing, you may have to change your markers. When you’re happy with what you’ve done, you can store everything – the reusable score sheet and the markers in an envelope. If you want to be more creative, you can go ahead and decorate your score sheet. You can personalize or customize it however you wish to make using it a lot more fun.